“Crap!” I banged the steering wheel with my palm. “Rats!” I was driving back to Vermont after meeting, last week, with one of the sources of great inspiration for this project: David Gillespie. In fact, everything had gone great. Despite my unpredictable health as of late, I’d managed to sufficiently finagle my schedule (and that of my family) soon after I found out the author of Sweet Poison was going to be in New York City for a few days and had offered to meet up with me. Of course, getting anywhere from rural Vermont is a bit of a task, but since I wasn’t planning on being in his stomping grounds (Australia) anytime very soon, it seemed like a unique opportunity. So, dressed up and bleary-eyed, I left home at 6:45AM, drove to the suburb of White Plains, hopped on the commuter train and was dumped out in Grand Central in time to meet him for lunch at 1PM. Phew! In fact, I was early. Really early. And nervous. I started to have “What if…?” thoughts. What if he thinks I’m a moron? What if this lunch will necessitate an involved conversation about GLUT proteins and the role of the hypothalmus? What if my writing is waaaay more interesting than I am in person? I know, I know. But these are the things one worries about when you get to the restaurant where you’re supposed to be meeting one of your big inspirations and you have a full hour to get anxious. I was just deeply grateful that my car hadn’t failed me, the train hadn’t been late, I hadn’t gotten lost, I didn’t feel nauseous and it wasn’t a bad hair day. And of course, I needn’t have worried. David Gillespie, I am happy to report, is about as easy-going a guy as you’re going to encounter. He’s reserved, witty, and quietly passionate about his work. Like me, he’s the kind of person who prefers to state his case in print, and let others make of it what they will, and who isn’t especially fond of having to “sell” people on his ideas in person. And the book’s power to convince has worked well. I was amazed to hear that in Gillespie’s children’s school, in addition to making provisions for children with allergies and food sensitivities, they also make provisions for kids who aren’t eating sugar. Let me say that again: they make provisions for the children who aren’t eating sugar. As many as ten different children in a single grade level. 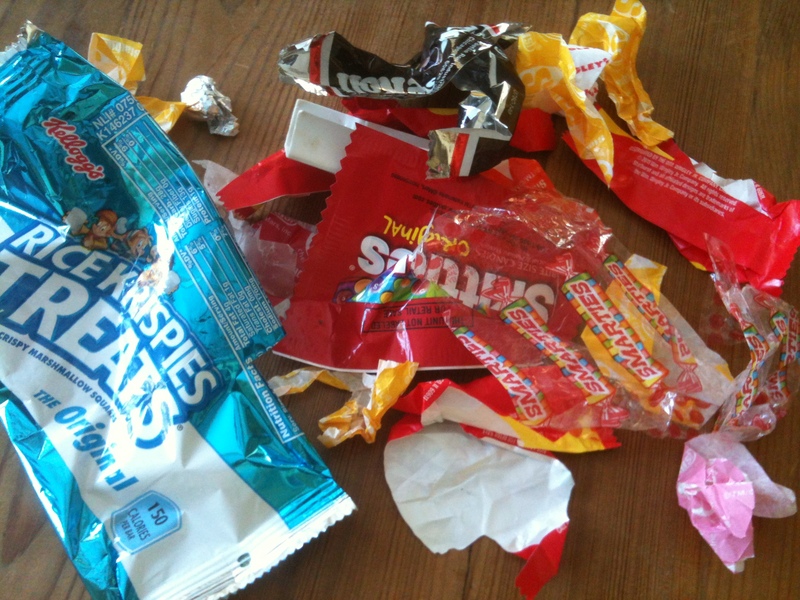 By way of contrast, I related the story of my older daughter’s recent standardized testing, which went on for three days, the by-product of which was a tiny mountain of treat wrappers which she dutifully carried home for me to see. “And this doesn’t include the ice cream every day!” she added, helpfully. I know the teachers are simply rewarding the kids for their hard work and that their intentions are entirely well-meaning. I know not everyone sees candy as a bad thing, but rather a harmless, inexpensive way of bestowing a little innocent affection on children. However. At what point will we begin to realize our goodwill has run amuck? Your honor, I present Exhibit B: yesterday, at the Farmer’s Market of all places- where we buy much of our organic produce and hormone-free meat- there was candy bloody everywhere in anticipation of impending Halloween festivities. At this point, despite telling myself everyone’s intentions were kind, I was starting to get a little peeved. “What, do they not think they’ll be getting enough candy tomorrow?” I muttered. “Is an entire pillow-case-full not enough? 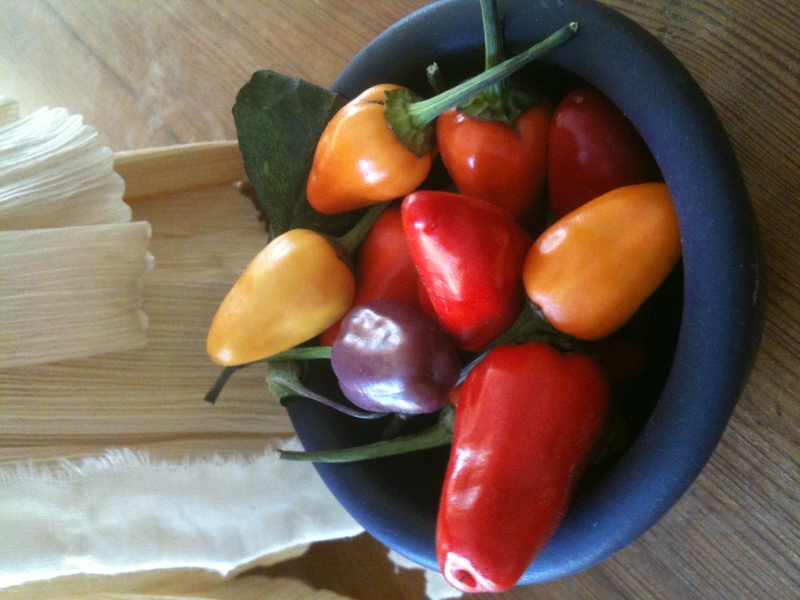 ?” After demurring the bowl of cheap treats that was proffered, at nearly every single table, one fellow held out to us a bowl of brightly colored hot peppers, causing us to double-take. He laughed and assured us that the next table had candy. Lucky for Gillespie (who is father to six children, all of whom are subsisting un-deprived on No Sugar) they don’t have Halloween in Australia. They also don’t have High Fructose Corn Syrup. But they do have all the same sugar-related health problems as Americans (diabetes, heart disease, obesity, etc. ), which surely negates the argument that HFCS is any worse than plain old familiar sugar. I learned this, and so many other interesting things at our lunch. I learned that balsamic vinegar isn’t really vinegar and is fortified with sugar. I learned that Crisco was invented in 1911. I learned that Gillespie’s next two books will detail what he feels is the other great dietary scourge of our time: seed oils. (Canola, vegetable, corn, hydrogenated oils etc.) According to Gillespie, these are even harder to ferret out than sugar, and are the other piece of our health puzzle, namely: cancer. Whoa. So why was I so annoyed on the drive home? I realized, way-belatedly, that I had completely forgotten the bloggers code: Always. Take. Pictures. Did I take a picture of me and him? Did I take a picture of what we ate? The restaurant? The bum outside? Anything??? Nope. You know, sometimes it’s a wonder I manage to leave the house with my head still attached. Oh well. But I know what you’re wondering: where do two No Sugar proponents eat for lunch in New York City? We ate at Les Halles (fittingly, the restaurant of another of my favorite writers, Anthony Bourdain.) We had some very nice steaks and french fries. And a side salad… with no dressing. I have a friend whose daughter attends the same school as my girls. She absolutely forbids her child to have sugar at school. So, once a month she makes organic, Stevia-sweetened berry muffins and leaves them in the freezer near her daughter’s classroom. The teacher is instructed to take a muffin out to thaw on those days when somebody has a birthday (cupcakes all around!) and any other day her kid may “miss out” because everyone else is having the sugar fest. I was inspired to follow suit. Instead of her child feeling “weird” or “different” she says she feels “special”. Kudos to the moms willing to go the extra mile! You are currently reading A Year Of No Sugar: Post 79 at Eve O. Schaub.